Gilbert Spencer was the most English of landscape painters and rooted in the English traditioni. Significantly, Edward Marsh, the art patron at the centre of the Georgian poets circle, was the first to buy one of Gilbert’s pictures – a sketch called Feeding Pigsii. Gilbert’s talent emerged just before, but mostly after World War I when there was a great turning back to nature as a source of spiritual strength. He was highly skilled at composition and a close observer of rural life. There are echoes of the Italian primitives in his early work and of the Pre-Raphaelites in his landscapes but he was unsusceptible either to French post-Impressionism or the French landscapeiii. His formative influences were his musical family (he too, played the piano and composed) , a childhood spent in observation of nature, the idiosyncrasies of late Victorian village life, making wooden models of farm carts, and his close relationship with the genius of his older brother Stanley. Considered the rowdiest of the boys, Gilbert was comfortable playing football with the village lads and cricket and card games were enthusiasms that continued into his adult life. Gilbert’s formal education did not begin until he was sixteen when he was sent briefly to private school in Maidenhead and then to Camberwell College of Art and Crafts. At Stanley’s suggestion he followed him to the Slade on a part-time basis under the legendary tutelage of Henry Tonks. With the outbreak of WWI (1914-1918) Gilbert joined up late in 1915 but initially in the Royal Army Medical Corps to placate his motheriv. Stanley followed him to the Beaufort Hospital in Bristol. Gilbert felt unable, in conscience, to sustain this position and asked to be seconded for active service. He was sent to Salonika and later transferred to serve on hospital ships in the Mediterranean, and then to North Africa for the duration of the war. By extreme good luck neither of them was sent to the Western Front but nevertheless for Stanley the impact of the war was devastating and malaria and the heavy carrying undermined his healthv. Gilbert, less intense, less intellectual, downplayed the effect on his own life. In 1919 he returned as a full-time pupil to the Slade and his talent very quickly attracted attention. Through fellow student Hilda Carline he became part of a circle of artists centred at her home in Downshire Hill, Hampstead and began to enjoy professional success. Tensions with Stanley erupted around the subject of landscape painting where Gilbert’s talent was ascendantvi and over the courting of Hilda where Stanley succeeded in his suit and manoeuvred Gilbert’s unhappy removal to Readingvii. Gilbert was saved by an invitation from Lady Ottoline Morrell to live at a cottage in Garsington where he enjoyed the company of the Bloomsbury circle and taught in Oxford at the Ruskin School of Art. In 1930 he married one of his former pupils, Ursula Bradshaw, and eventually settled down to family life in Upper Basildon, Berkshire. 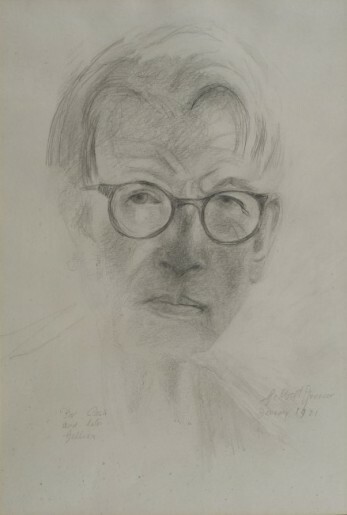 Too anxious by nature to attempt to support a family by painting alone he embarked on a long and distinguished career as an art teacher at the Royal Academy (1932-48), Glasgow College of Art (1948-9) and then at Camberwell School of Arts and Crafts (1950-7). For his one man show at the Goupil Gallery in 1932 he painted as a centre piece The Cotswold Farm which demonstrates his superb skills of dramatic composition. His landscape painting, which focussed generally on Dorset, Berkshire, Oxfordshire and the Lake District, settled into a distinctive style during the 1920s and 1930s. He undertook some ambitious murals for Balliol College, and the Artist’s Progress at the RA and the Scholar Gypsy at University College London. During WWII (1939-45) Gilbert served enthusiastically in the Home Guard first in Basildon and then in Ambleside when the Royal College of Art relocated to the Queen’s Hotel. The Imperial War Museum commissioned a number of pieces of work from him. The first commission in 1941 was of Troops in the Countryside followed by a portrait of John German. The following year he painted the Grasmere Home Guard. This was a subject for which he had a great fondness and he drew twelve large cartoons of the Home Guard that were exhibited by the Artists International Association in 1944. His gently humorous approach that prefigured the television series Dad’s Army (1968-77) did not find favour with the IWM which declined to purchase them. However, the Museum did commission four further portraits in 1943. Gilbert became a successful and sought-after portrait painter and was elected to the Royal Academy in 1960 – an institution with which he had a somewhat fractious relationship. He could be quite as outspoken and opinionated as his brother. [i] Stanley Spencer by Keith Bell page 240. [ii] Edward Marsh: A Biography page 506. [iii] On holiday in France Gilbert was unable to paint. Memoirs of a Painter page 67. [iv] The Spencers were conventionally patriotic and at the declaration of war in August 1914, Florence and Percy discussed the prospects: “A family of seven sons, he (Percy) said sadly, could not stand aside, and it might be that if he went, the younger ones might not have to go.” Introduction to Mosaic. [v] See Florence Mosaic, page 73. [vi] Stanley tried his hand at landscapes during a holiday with Gilbert in Dorset and later in life painted landscapes purely for the relatively easy remuneration. Patricia Preece thought that “He (Stanley) had no feeling at all for the beauties of nature as that term is generally understood. The subtle play of light and shade, the influence of atmosphere pervading a scene, the mood of a place as expressed in contours, did not interest him in the least.” A Private View of Stanley Spencer page 83. “As far as I was concerned I had no wish to change my mode of life, but Spencers are at first too obliging and too angry too late, and for the next eighteen months I was cut off from all the friends and life that I so much enjoyed. By the end of that time, though my resources had become low, and my life heavily circumscribed, at least my painting had not suffered.” Memoirs of a Painter page 69. Kenneth Pople’s research has revealed that Gilbert was cited in the divorce proceedings between Tom and Mabel and that her son was registered in 1922 as illegitimate with the name Peter Spencer. See Pople, Stanley Spencer, page 214 note and page 518. [ix] Quoted in Memoirs of a Painter page 76.